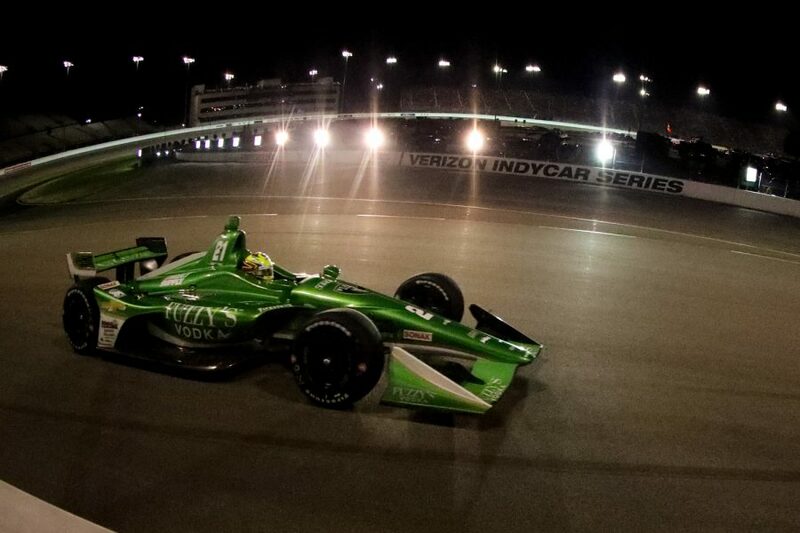 – Spencer Pigot turned in one of his strongest performances of the year tonight in the season’s final oval race. Despite never having raced at Gateway Motorsports Park, Pigot battled his way through the field to earn a 6th place finish in the Bommarito Automotive Group 500. – Beginning early Friday morning, heavy rains arrived in the St. Louis area and the precipitation did not stop until midday. Practice was originally scheduled for 12:15-1:15 p.m. CT but did not get underway until 3:30 p.m. CT. Though the one-hour session was abbreviated by more moisture, Pigot was able to turn 33 laps. His last lap was his fastest at 181.501 miles per hour (mph), which was 7th quick during the session. With rain coming back to the area, Verizon IndyCar Series officials decided to scrap qualifying in favor of an extended evening practice session. With qualifications cancelled, the starting grid would be set by entrant points. Therefore, Pigot would start the 248-lap race from the 14th position. – Two turns into tonight’s race, a yellow flag flew. Pigot was hit from behind by Takuma Sato, but fortunately there was no damage to the No. 21 Fuzzy’s Vodka car. For the ensuing restart on Lap 7, Pigot was in his original starting position of 14th. He maintained that position for over 100 laps of the race, up to the second round of pit stops. – Pigot’s No. 21 Fuzzy’s Vodka crew gained him a position during his second green flag pit stop, moving him up to 13th. Soon thereafter, Pigot passed James Hinchcliffe for the 12th position, then cycled forward as the next round of stops began. The caution flag flew on Lap 173 as a competitor lost power and required a tow-in, making Pigot the beneficiary of a wave-around and he was able to re-join the lead lap. He was also able to make his third pit stop under the yellow flag and took the Lap 183 restart from the ninth position, back on the same lap as the leaders. – Making the most of being back on the lead lap, Pigot got to work. He passed Takuma Sato at the restart to move into 8th, then worked his way around Josef Newgarden just prior to the 200-lap mark. His next targets were Alexander Rossi and Ed Jones, both of whom he passed by Lap 222 to earn himself a position in the Top 5. He was forced to pit for a splash of fuel on Lap 237, just 11 laps from the conclusion of the race. However, all lead lap cars but one had to stop. Rossi was able to stretch his fuel until the end of the race, allowing him to finish in second. Pigot would bring home a 6th place finish, his second-best result of the year. – Before earning ECR’s full-time No. 21 entry, Pigot spent two years as the road and street course driver of the team’s No. 20. As such, he competed in an Indy car race for the first time at five of the six ovals on this year’s schedule, including Gateway Motorsports Park. Pigot’s 6th place finish tonight is bettered only by his result earlier this summer at another short oval, Iowa Speedway. Similar to this evening’s event, Pigot had fallen one lap down to the leader in the early stages of the 300-lap event at Iowa. Also similar to this evening, he raced his No. 21 Fuzzy’s Vodka Chevrolet through the entire field, climbing up to a second-place finish. It was the 24-year-old’s first podium finish in the Verizon IndyCar Series. – The Verizon IndyCar Series is currently in a string of three back-to-back races and will travel to Portland, Oregon next week for Indy car racing’s return to the Pacific Northwest. Pigot will be back in the car in just four days for a test day in advance of the penultimate round of the 2018 Verizon IndyCar Series season, the Grand Prix of Portland. The road course race will be broadcast live on NBC Sports Network at 2:30 p.m. ET on Sunday, September 2.